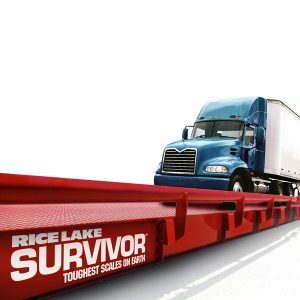 The compact, low-profile Rice Lake Survivor OTR Series truck scale installs quickly-ready to weigh heavy loads and withstand constant traffic. Both the OTR concrete and steel deck modules feature wide flange 1-beam construction and are built to meet federal bridge standards. The steel deck design features twelve 12″ wide flange beams on 12″ centers running longitudinally with the traffic flow beneath a 5/16″ diamond plate deck. The concrete deck features 12″ main beams and 6″ beams under a 6″ thick slab of concrete. See pdf download for product specifications.